2017 is a year that celebrates Scotland's historic environment and past. This cruise offers the opportunity to discover the spectacular landscapes of the Hebrides, visit archaeological sites, soak up rich culture and enjoy breathtaking scenery as we sail sublime coastlines. Setting sail from Oban this evening we cruised north to our overnight anchorage in Loch Linnhe. From our berth at Craignure, Isle of Mull, guests disembarked for a visit to the seat of the Clan Maclean, Duart Castle. Our afternoon port of call was Ardfern where we tendered guests ashore to explore Kilmartin Glen, famous for its rich archaeological legacy. The site contains 800 ancient monuments including burial cairns, rock carvings and standing stones. We anchored overnight in Loch Caolisport. This morning we arrived at Port Ellen, Islay to discover the ancient sites where the installation of Lords of the Isles took place in the 14th and 15th centuries at Finlaggan. During our afternoon cruise of the Sound of Islay and the Garvellachs on passage towards our overnight anchorage in Bloody Bay, Bruce Bennison gave the first of his talks in the Tiree Lounge, titled ‘An Introduction to Archaeology, History and Landscapes of the Hebrides’. During a morning cruises of the Small Isles, Sound of Sleat, Kyle Rhea and under the Skye Bridge, Bruce Bennison gave the second of his talks in the Tiree Lounge ahead of afternoon walks in the pretty conservation village of Shieldaig. We anchored off Staffin Bay, Skye, overnight tonight. Today was spent in Stornoway, Isle of Lewis. Our morning tour inlcuded the Gearrannan Black House village, the Callanish Standing Stones and Dun Carloway Broch. In the afternoon guests visited the Lews Castle Museum or enjoyed free time to explore Stornoway independently. This morning Bruce Bennison gave the last of his talks in the Tiree Lounge titled “The People of the Sea – the Hebrides in Prehistory”. BBC Coast presenter Nicholas Crane also gave a presentation titled “Coasting”. We berthed alongside in Oban in the afternoon where guests had the opportunity to visit the Oban Distillery or go for walks to either Pulpit Hill or McCaig’s folly. We remained alongside in Oban overnight and guests were entertained after dinner by local musician Gary Innes. Our morning excursion took us to Dunollie Castle and Museum, ancestral home of the Clan MacDougall. After lunch on board our final visit was to Ardchattan Priory where there has been a garden since the 13th Century. 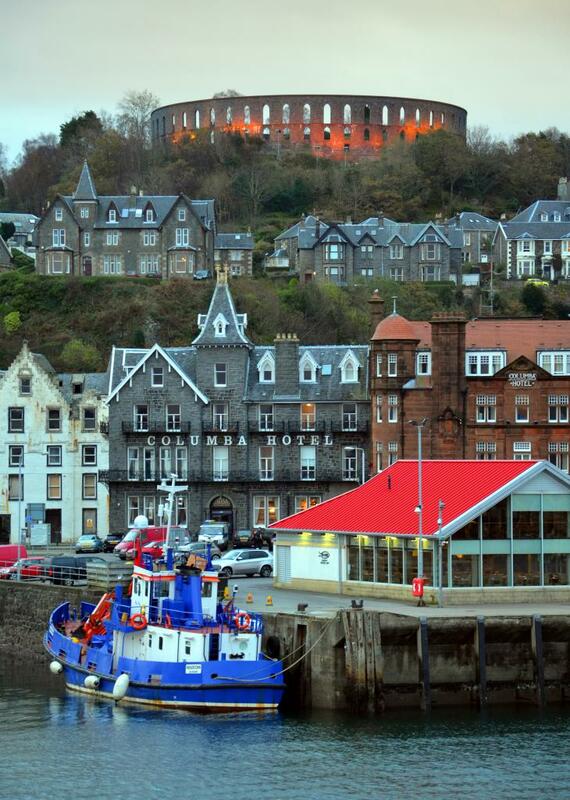 The farewell Gala Dinner was held alongside in Oban.